The Family Nurse Practitioner (FNP) program prepares family nurse practitioners to provide cost-effective, quality, primary care with an emphasis in rural health. The curriculum combines practice-oriented didactic instruction with extensive clinical experiences in multiple settings. The program reflects the commitment of the College to provide graduate education that is clinically relevant in today's evolving health care environment. 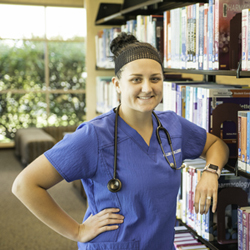 Students complete core coursework toward the Master of Science in Nursing degree. In addition, students complete advanced practice and family nursing course work with a life cycle perspective. Theoretical and experiential learning are integrated in seminar and clinical experience throughout the program. The Family Nurse Practitioner (FNP) has a broad scope of practice which includes ages birth to death. Graduates of Allen College FNP program are prepared to work in family practice clinics but may work in a variety of clinic settings. Regulations required for practice and prescriptive authority vary from state to state. National certification through examination by either the American Nurses Credentialing Center (ANCC) or the American Academy of Nurse Practitioners (AANP) is required prior to state licensure. For further information regarding specific state requirements, please contact your state's Board of Nursing. Who can apply for the Allen College Family Nurse Practitioner Program? Registered nurses with a bachelor's degree in nursing from a regionally accredited school may apply. (Students who hold a bachelor's degree in a field other than nursing may also apply. They will be required to take undergraduate courses in statistics, nursing research and community health prior to enrollment in certain master's level courses in addition to holding an associate's degree in nursing). A minimum overall undergraduate grade point average (GPA) of 3.00 on a 4.00 scale is required. A minimum of 800 hours of clinical nursing experience as a registered nurse is required for enrollment in courses with a clinical/practicum requirement. Do FNPs have difficulty finding employment? FNPs have generally found work in an advanced practice role within months of their certification. Willingness to work in rural or underserved areas or in specialty areas increases job opportunities. Students are apprised of area job opportunities on the Allen College website and many students have job offers prior to graduation. How are my clinical preceptors chosen? For the most part, students will identify their own preceptors. This enables students to choose the types of experiences they feel they need/want the most. It also enables them to choose preceptors that might be closer and more convenient for them. Students may request assistance in this process from their clinical faculty or the MSN Clinical Coordinator. Is nurse practitioner certification currently available? What are its requirements? Where would I find out more information? Steps to become a certified Nurse Practitioner.